Kitchen and bath trends are no longer about keeping up with the “Jone's”, but setting styles apart from your neighbors. Homeowners are seeking more unique, individual designs with efforts on personalization to better suit individual needs. This is proving to be a difficult task for builders and Remodelers who have gotten used to a safe cookie cutter box. Homeowners are now demanding flexibility and creativity. With the amount of time spent in the kitchen cooking and eating in combination with more older couples spending time entertaining and eating together in the kitchen, floors that are softer and with more cushion are finding their way into kitchen design. Hard surfaces are durable and easy to maintain, but the stress on your joints and pain after standing on hard floors for several hours is making softer kitchen floor surfaces more and more appealing. Cabinet styles are boasting European and contemporary lines. Even more traditional companies like KraftMaid are offering collections like their new Venicia collection that are sleek cabinets with clean lines and unconventional shapes. A focus on interior style is becoming more prominent. The cabinet doors with less detail are making their statements with an emphasis on hardware and pulls. Stained cabinets are still found more in primarily traditional homes, but cabinet manufacturers today realize that stained cabinet finishes can date very quickly. Brushed painted finishes and glazes can be found in all cabinet companies, but the ability to have custom finishes and glazes are one more place that you can personalize and customize your kitchen. If you are willing to take the risk, new species of exotic woods are available for cabinetry. A great place for a stained contrast is on the kitchen island or a single base cabinet that is recessed or protrudes from a different plane than the rest of the cabinetry. The most popular stained species are maple and cherry and oak is rarely used anymore. Perhaps the desire for neutral colors in the kitchen is not only for resale and longevity, but because kitchens are so open that they often flow right into the main living space. Neutral colors can also help maximize the feeling of lightness and serve as a background for a special personalized accent. These open plans are also beginning to replace formal dining rooms because if you’ve ever entertained you know that people always gather in the kitchen. The trend now is to continue the conversation right over into the eating area in the kitchen. There will always be formal dining rooms in formal homes, people are just moving into different directions to suit their lifestyle. In addition to using cabinets in the kitchen, furniture pieces and furniture style cabinet pieces are being incorporated to break up the monotony of cabinet boxes. Quartz surfaces are still very popular and are adding a twist of sophistication with authentic new finishes. Silestone has a new leather finish, Caesarstone has a new limestone look and Cambria is introducing a series of new faux marbles. Soapstone is increasing in popularity because of its natural look without the staining issues with marble. Granite is still king, but people are now requesting their own slabs to ensure the individuality of the stone. Thicker slabs are being used on islands to differentiate from the main countertops. Natural materials and materials that appear to be natural are maintaining their position. Bamboo, because of its popularity for being “green” can be found everywhere from floors to countertops to influenced cabinet hardware, kitchen accessories and even shower doors (Lasco) and faucets (Moen). 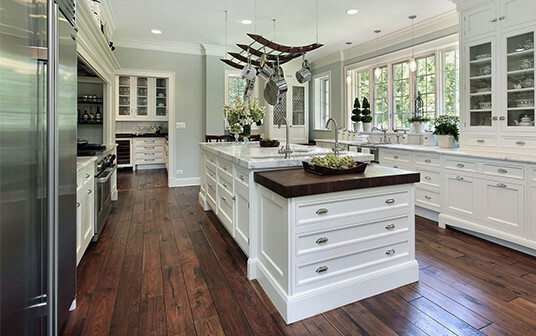 Butcher block and other wood countertops are growing in popularity. The type of countertop is changing as well as the shape of the tops. 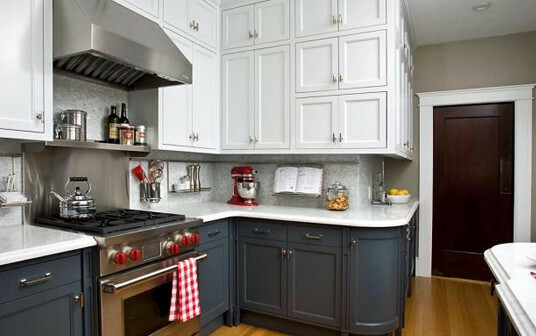 Countertops are no longer a “fitted” look. Fluid, free style shapes are being used to complement the natural materials being used on the countertops. Glass sinks that are: opaque, handblown, custom designed artistic styles are replacing standard prep sinks. Glass tiles (mosaics to Depression-era glass tiles), glass countertops, opaque glass on cooktops, refrigerator doors, cabinet doors, Venetian glass light fixtures, glass accents are also available to use almost everywhere to add light and drama. Kitchens are being laid out to cater to each cooks individual needs and preferences. Cooking stations are being designed for multiple users including space for entire families to cook together. Zones are created for individual cooking stations such as baking zones, food prep zones, storage and pantry zones, cell charging stations, MP3 docking stations and laptop plug ins. Dual appliances are making their way into kitchens. Popular dual appliances are cooktops, sinks, ovens, dishwasher and refrigerator drawers placed in personalized specific zones to allow for faster cleanup and more specialized storage. Some kitchens even plan for 2 microwaves so that one is accessible to children. Tile backsplashes are a great place to express creativity and personalization as well as maintain their function of wall protection from grease and food splatter. Custom designs, glass and mosaics can easily be incorporated to carry out a theme or tie a design style together. With today’s focus on green living, the kitchen has its contributions. Separate storage spaces are being created for non-recyclable waste, recycling, plastic bag storage and space for green boxes or compost. More kitchens will be cooking with natural gas because they are faster and more energy efficient than convection ovens. You also don’t lose energy when the element of a gas range is shut off. There is no shortage of energy efficient appliances like dishwashers that use less water than when you wash by hand. 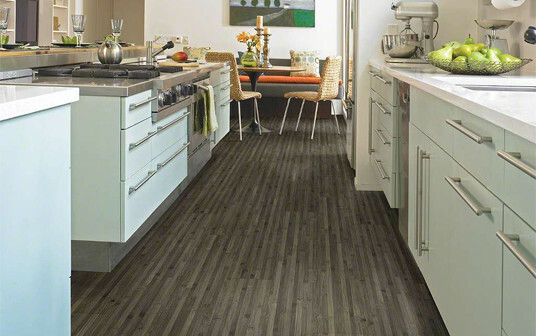 Floors can be found made of sustainable materials like bamboo and cork as well as reclaimed hardwoods and tiles. The balance between function and fashion is always a struggle, but with today’s technology advances and custom options it is possible to have a kitchen that is sleek and stylish with all of today’s amenities well hidden, but masterfully planned. After all, kitchens are a new status symbol much like the statement that used to be made by the car you drive. Induction cooking (cooking technology which transfers direct heat to cookware from an induction coil beneath the ceramic surface through a magnetic field to generate instant heat) is making a comeback from the 80’s from reputable companies like Thermador, Viking, Gaggenau and Wolf. Ovens are available that have steam options to make perfect bread. What will they think of next? “Fresh” refrigeration, cultivating a longer food lifespan is the trend in refrigeration. In Samsung’s four door convertible refrigerator, it allows the user to control humidity in all 4 interchangeable freezer/refrigerator compartments. Others with storage control options are available from Sub Zero and Liebherr. Drawer appliances like refrigeration drawers, dishwasher drawers and even microwave drawers like the one introduced by Sharp are still popular. They are evolving from single function drawers to combinations like Thermador’s oven/microwave/warming drawer combination. Rather than bringing avocado appliances back, new colors are being introduced like Dacor’s new slate gray. Their intention was to maintain the sleek look of stainless but with a softer finish. Jenn-Air has branched out to offer a line of bronze appliances. There is no shortage of technological advances with appliances these days either. You can call your oven to tell it to start cooking, maintain the proper temperature of your food until it’s time to cook or listen for Samsung’s PopCon refrigerator’s audible alert for when food has expired. You can even enjoy a 14” LCD screen in your Faber range hood. With the focus on being healthy, steam cooking options are available through Kitchen Aid with their duel fuel oven with steam option to keep food moist. Sharp is offering this option and Gaggenau has improved on an existing product by adding its Master Chef Technology. Vent hood efficiency is seeing an improvement as well as improvements in design. Much more attention to detail and style is being offered in vent hoods. Who knew vent hoods would ever become a work of art?!? Built in coffee machines are becoming a must in new kitchens. More and more companies are beginning to include them in their line up. However, they are now becoming affordable from brands like Brew Express. For the luxury homes, you might even find built in teriyaki style grills! 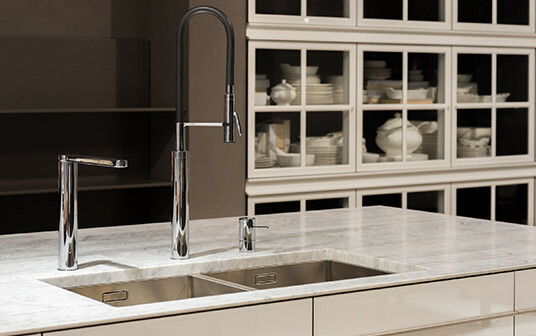 High profile designers are leaving their mark on the kitchen industry. Electrolux now offers a Nicole Miller line, THG has a Jamie Drake line and Fu-Tung Cheng and David Lewis are attached to Zephyr’s new lines. Relaxation. Relaxation. Relaxation is the key to today’s bath projects. People are working harder and harder these days and are requesting spa like atmosphere’s to enjoy in the comfort of their home. Kohler and Jacuzzi are offering two person whirlpool tubs with individual controls. Soaker tubs are being replaced with multifunctional tubs with chromatherapy, aromatherapy, hydrotherapy, new heating elements to keep the water warm during the entire bath, heated air jets, and jet integrated illumitherapy LED lights! Tubs and sinks are not just square or utilitarian anymore. Shapes are leaning more organic to encourage circular flow and movement. Egg shaped, round shaped and other organic curved shapes are creating the relaxing Zen like atmosphere that feels like a spa retreat. Kohler has an overflowing tub called the Sok that mimics the overflowing infinity edge pools. Showers are generating their own attention with features never offered before. Showers are now being labeled “super showers” because of series of multiple body sprays set at homeowner specific heights, thermostatic controls are being used to prevent scalding, steam generators, more natural light in showers and task lighting in showers. Over sized benches are being created for you to sit and relax and enjoy all of the features in the shower. Rain showers are evolving into larger and more efficient models including models that are flush ceiling mounted. Rainshowers are being mixed in with other types of shower heads like Kohler’s shower tiles. Technology has found its place in bathrooms with mirrors that double as televisions, lighted faucets, water being incorporated as a design element, surround stereo sound. Toilets that do everything from raise the seat lid when it sees you coming right down to the washing and drying all in one unit. Your shower can even clean itself while you are away! You might not think of appliances being in the bathroom, but refrigerators are being used for tub side beverages and bubbly, heated towels heated on a rack or in their own drawer, there are even refrigerated vanity drawers! Toilets are being designed with dual flush systems to use less gallons of water per flush. Urinals are finding their way into residential bathrooms, more stylish and cleanly. Sinks are no longer just round white bowls. Sinks come in shapes, sizes and colors that make them part of the design rather than just a place that holds water. Vessel sinks, glass bowls, pottery pieces are all making their way into sink styles. With vanities looking more and more like furniture rather than cabinets, unique sinks are a natural extension. Separate vanities at individual heights are part of bathroom’s personalization trend. Furniture pieces that are more like dressers are being used in lieu of cabinetry for vanities and separate pieces for increased storage. Mosaics made from glass or natural stone and large format tiles are being used in baths to create unique spa like atmospheres. Non-square sizes like 12x18 are being used and installed in herringbone patterns for simple yet stylish installations. With everything else to catch your eye and keep your attention in the bath, faucets are quietly making their statement with clean, simple lines. Simple doesn’t mean boring, however. Faucets designed by designers like Pierre-Yves Rochon display simple elegance with damask patterned handles attached to knobs and spouts with clean lines available in 35 different finishes. 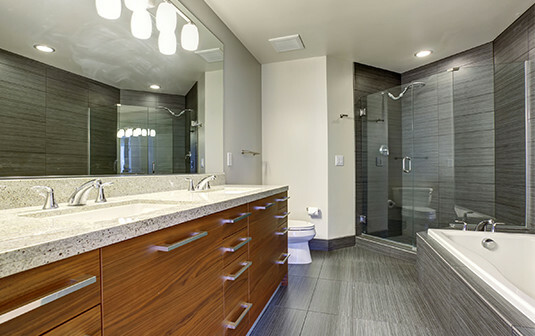 Colors that are leading the way in bathrooms are natural earth tones. The use of stone and matte textures help compliment this color style. Faucet styles are reflecting this trend with colors like copper, bronze and French gold finishes. Accents of aqua and blue help create the feeling of tranquility. Glass shelving, sinks and other glass accents help contribute to a feeling of pristine cleanliness that carries out the theme of baths being more like spas than just places to bathe. Glass is very useful in aiding in rooms appearing larger, more open and better illuminated. With all of the luxuries available, it’s not difficult to achieve your own personal retreat where you can pamper yourself or let the fixtures and gadgets do the work for you!